Support is at 1.217ish and then 1.20. If 1.217 holds, we could see another effort to break 1.25. If this happens, a rally to 1.275 and 1.32 should follow. Below you can see my long-term count. It's still the same as when I first posted it (I think in 2009). As you can see, the market is entering the area where cycle wave d should conclude. 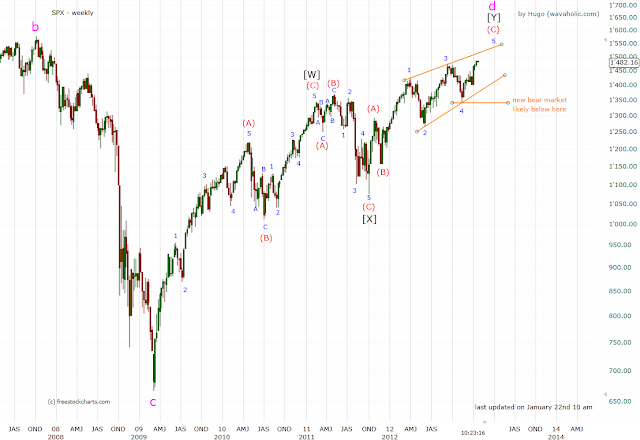 Once wave d is finished, wave e should unfold and lead the market to new lows. For a more detailed count, please read this post. The medium-term trend is up as long as we stay within the channel. 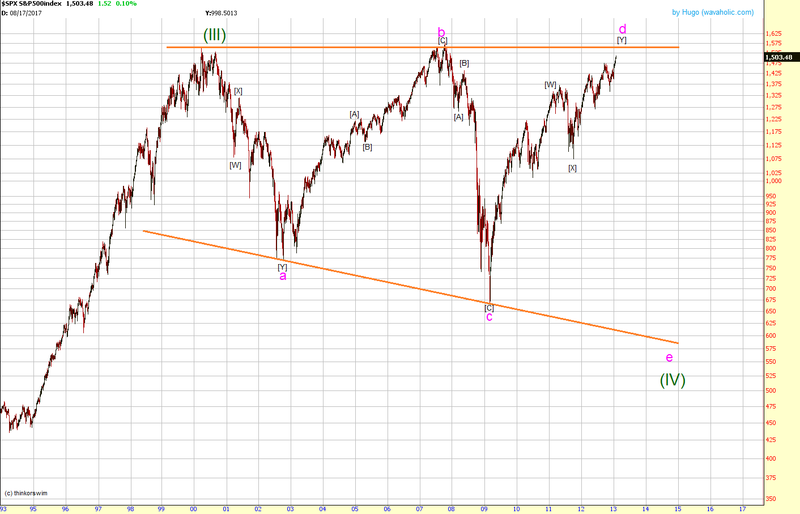 I've been bullish and calling for a bull market top around 1600 since mid 2010. Already in my last update in November I mentioned that the bull market might soon be over since we were approaching 1600. Back then, I thought that the market might fall short of my target. However, two months later, I think that we could still make it. The count above shows an ending diagonal in the (C) wave position to conclude cycle wave d. My preferred target for this count is 1520ish. 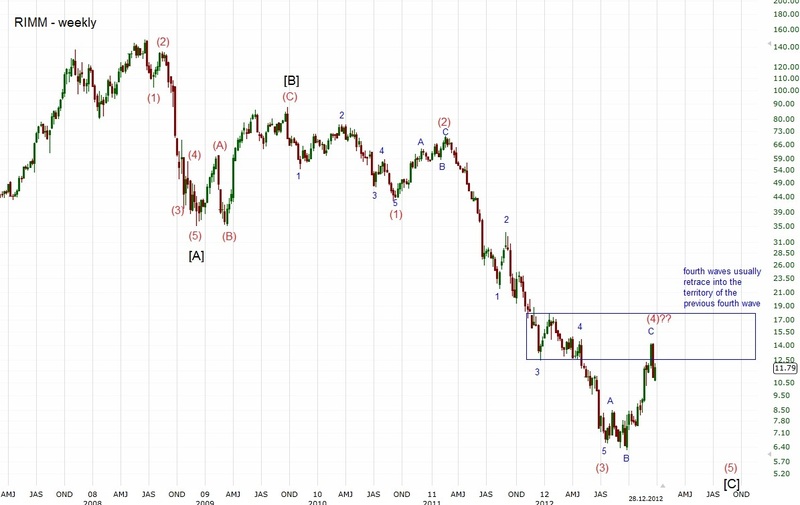 After that, cycle wave e to new lows (below 666) should follow. There is a slight variation to the ending diangonal count which allows for a rally to 1600 (triple zigzag (not shown in the chart)). 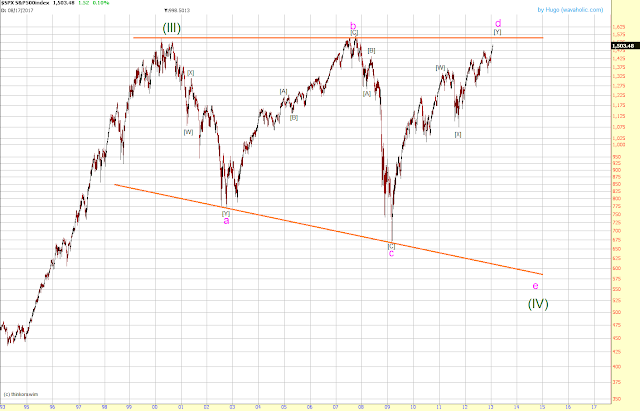 If we get a convincing break below 1350ish, a new bear market (wave e) is most likely underway. As long as we stay above it, I remain cautiously bullish. 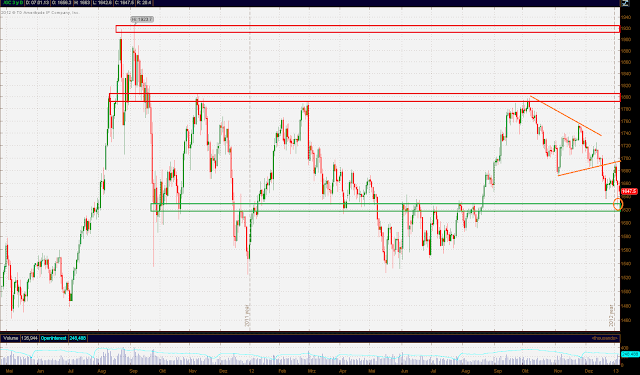 If we can hold this level, we should see 1.35ish next. A break below 1.33 though should lead to a decline to 1.315. Overall, the medium-term trend remains bullish as long as the EUR/USD is above 1.315. 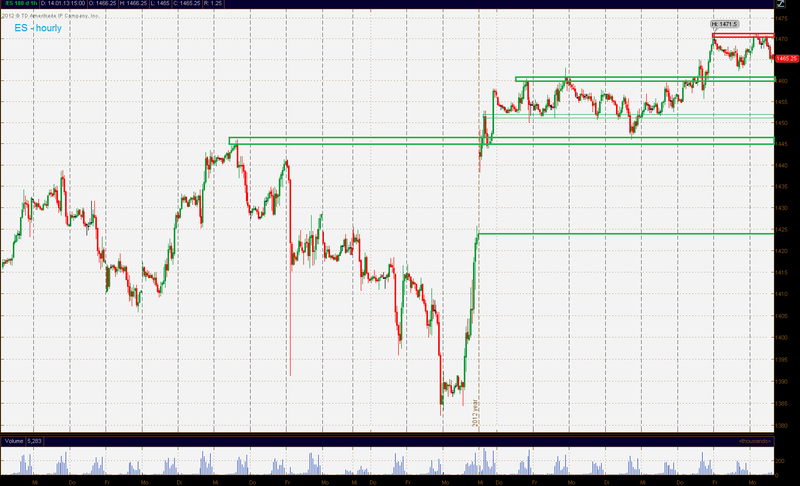 If we get a confirmation of today's move up tomorrow, we should see 1500+ soon. 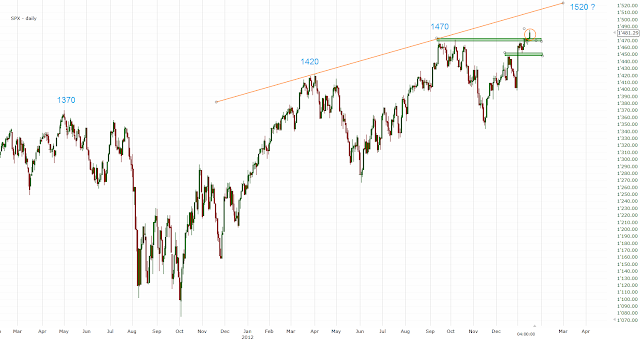 A possible target could be 1520 and then the all-time highs at 1570ish. All of a sudden the EUR/CHF spiked up to 1.24ish, a level we haven't seen for more than a year. 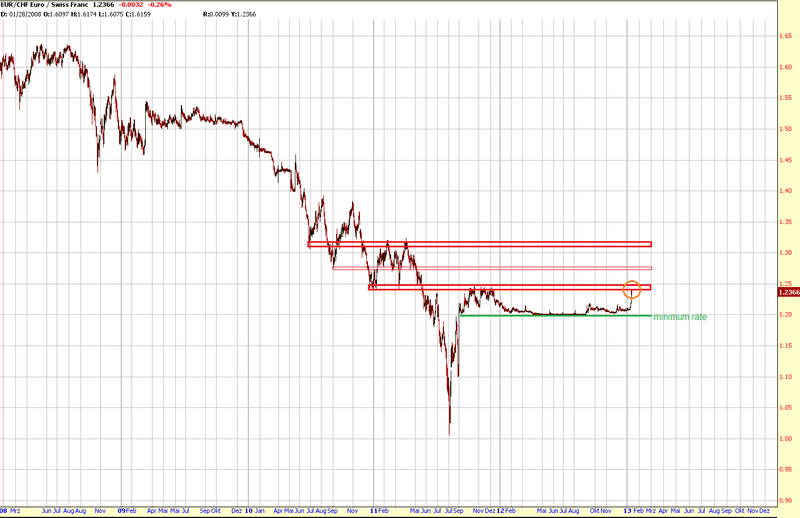 As you can see on the chart, the 1.24-25 area should be some heavy resistance. If breached though, we could see a rally to 1.275ish or even 1.32ish. The SPX continues to trade around the resistance at 1470ish. Not much has happened so far this year. All daily closes were within 1 % (the lowest was 1457, the highest 1472). Even more interesting is that the last four days were basically copies of each other: Down in the morning and then a steady climb up for the rest of the day. We're now already near my next target (1.35). 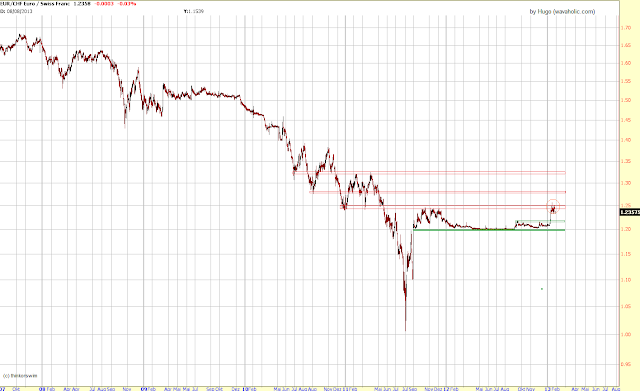 If we can hold above 1.33ish, we should get to 1.35 on the next rally. Above 1.35 there isn't much resistance until 1.38ish and 1.41ish. If 31ish is broken, we should see a rally to 33. 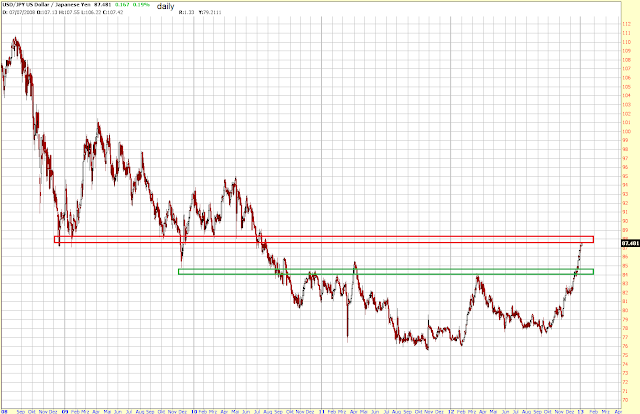 Should 30 be breached, the next objectives should be 28 and then the very strong support at 26. 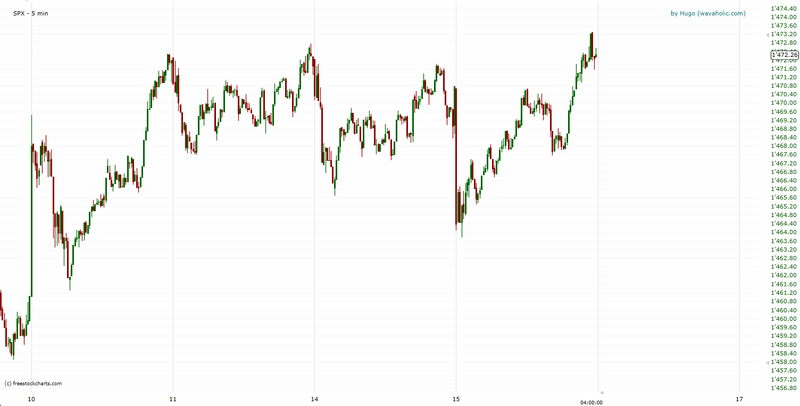 The SPX is still trading around the resistance at 1470ish. The bull market high is at 1474.51. If we convincingly break it, 1500 should be the next objective. We continue to trade in a tight range of about 15 points. A break below 1448 should lead to 1426 (open gap). 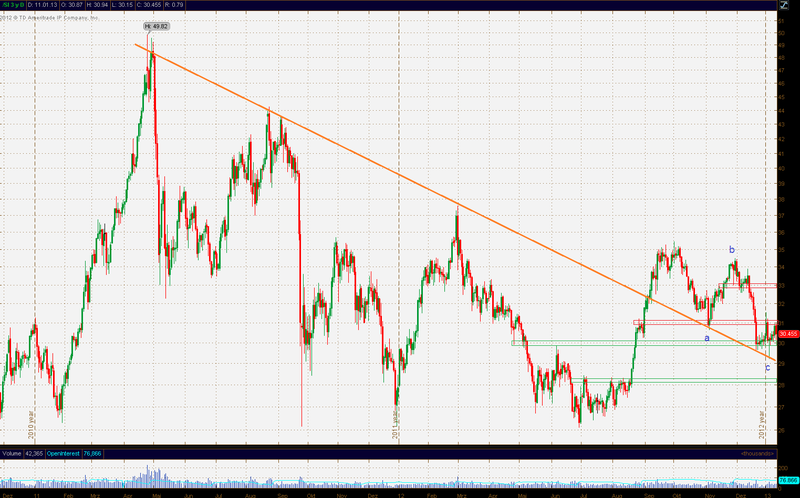 If we get a convincing break above 1470ish though, the next target should be 1500. As I said before, if 1448-49 is breached, we'll most likely decline to 1426. 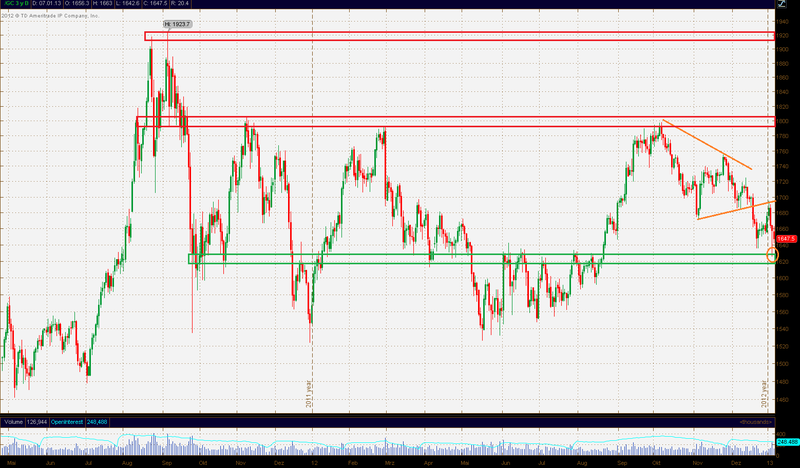 A break above 1458 on the other hand should lead to a rally back into the resistance area at 1465-70ish. I think we could see a bounce there. A possible target is 1457-58. 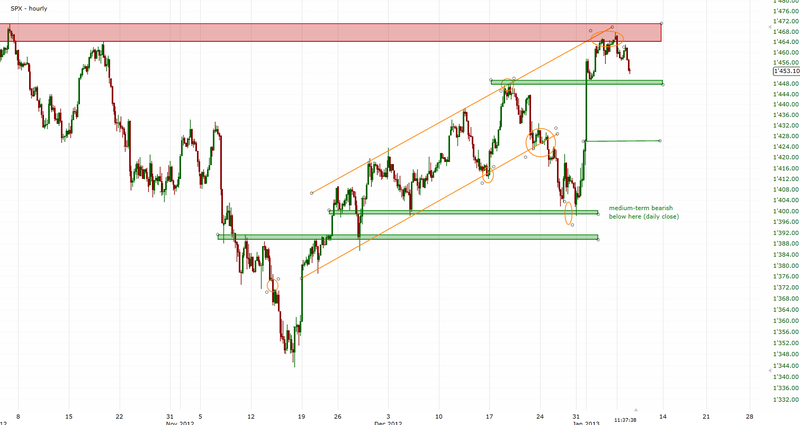 If the support doesn't hold though at 1448-49, the next target should be the open gap at 1426. I don't really like that the EUR/USD broke below 1.315 again. Thus, I'm now neutral after being bullish since mid-end November. A break of 1.315 should lead to a rally to 1.35. As long as we stay below it, 1.285ish might get retested. 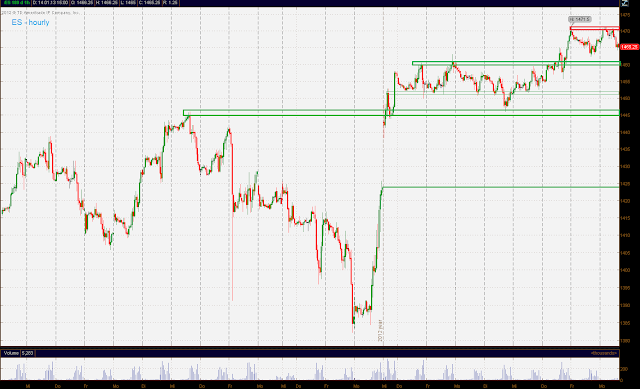 If 1630ish breaks, 1550ish should be the next target. Above 1700 we should move up to 1800 again. 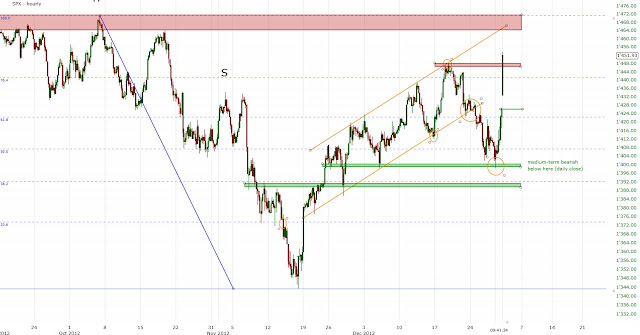 As long as we remain between these two levels, I stay neutral though. 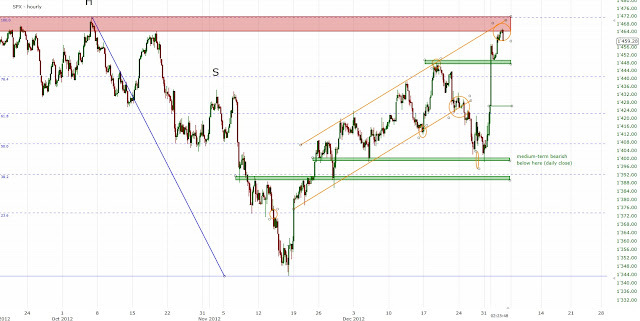 I'm still looking for a correction to 1448 and probably even 1426. As you can see we're near the resistance level at 88ish. If the rally stops in this area and the Yen puts in a reversal candle, I'll turn medium-term neutral (I've been bullish since mid October 2012). If that's the case, a correction to 84ish seems likely. I think we could see a correction over the next few days. 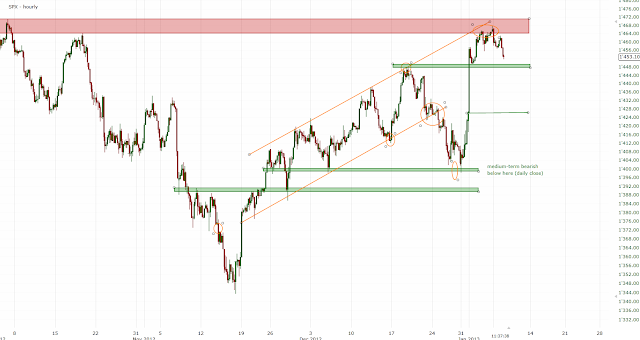 Potential targets are 1448 and the open gap at 1426. If we hold above the December high, we should rally towards 1470ish next.